After years of hegemony, the design pendulum is finally starting to swing back from modern, efficient design to an unvarnished, industrial aesthetic. Take, for example, this huge, heavy concrete slab filled with energy-annihilating incandescent lights. Designed by Seth Ellsworth, this light bar is just about the exact opposite of the fluorescent, disposable design you pick up at IKEA every time you move. Heck even its name, "my light is heavier than your light", smacks a stark contrast to the weird, unpronounceable Swedishisms. 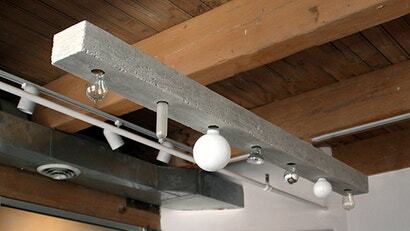 The fixture is available in either a smooth or rough finish, and it comes outfitted with specialty light bulbs. And don't even think about trying to install this on your own with a tiny hex wrench. The designer warns: "This item must be installed by a professional."